Prepare the tofu balls: mix ingredients well, make 15 football-shaped tofu balls (each about 2½" long, 1½" thick). Deep fry the tofu balls until golden brown. Put aside until ready to serve. Prepare the greens: stir fry with the garlic, lay the cooked greens evenly at the bottom of a dish. 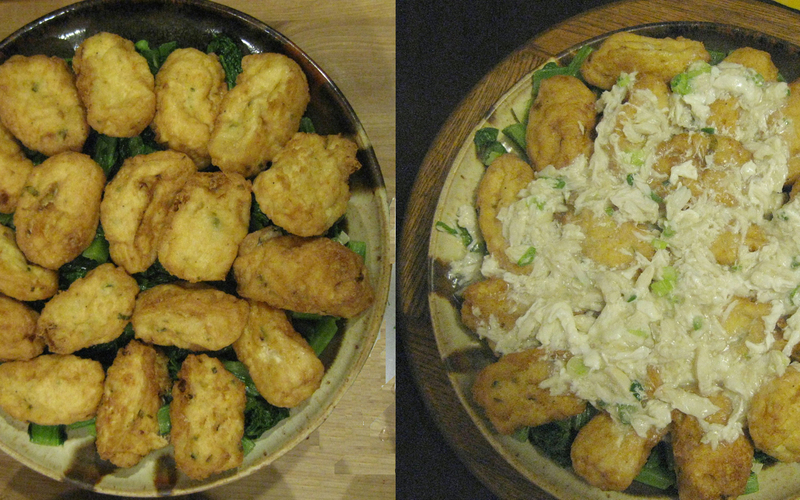 Arrange the tofu balls on top. Prepare the crab gravy: cook crab meat, scallions and chicken broth in a saucepan, thickening with the cornstarch mix until gravy-like. Pour over the tofu balls just before serving.